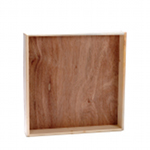 Fill-it-Yourself Acoustic Panel frames from ATS Acoustics are a cost-effective way to a professional, customizable result. 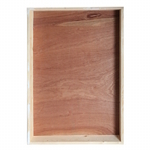 These are empty frames, ready to fill with acoustic material (Roxul AFB recommended for best fit), and cover with your own choice of fabric. 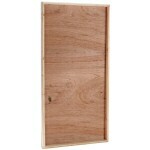 Please note that the dimensions listed are outside dimensions of the finished panel after adding insulation and fabric. 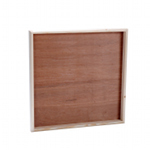 Select size(s) and quantity of frames. Select painted frames if a see-through dark-colored fabric will be used, otherwise select unpainted frames. Order enough Roxul AFB to fill your frames. 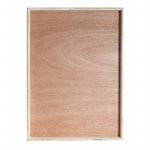 Note that these frames are designed for slight compression of the fill material at the edges, so rigid fiberglass boards such as Owens Corning 703 will not fit flush. 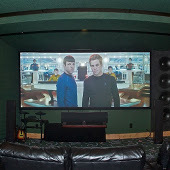 If desired, order ATS Acoustics Professional Installation Kits for flush-mounting your panels on walls. Cut the AFB to size and insert it into the frames. Cut and stretch fabric over the frame (you can use ATS Fabric, Guilford of Maine Fabric, or supply your own), and secure it to the back panel with a staple gun. 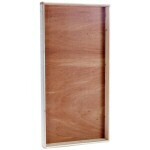 Install the panels on your walls. You’re done! Hello ATS, I used your 2" 703 to build my DIY side wall and ceiling first reflection panels, seen here front view.